The second short track event on the 2012 NASCAR Sprint Cup Series schedule, fans packing the Martinsville Speedway for Sunday's running of the Goody's Fast Relief 500 were looking forward for a more action-filled affair than the previous humdrum race at Bristol Motor Speedway two weeks ago. A 500-lap outing for 43 NASCAR Sprint Cup Series competitors on the 0.526-mile track would definitely gave the NASCAR ticket-holders of the Virginian short track a great value for the hard-earned bucks. With the #5 Chevrolet piloted by Kasey Kahne starting on pole for the second time in the young 2012 season, the NASCAR Sprint Cup Goody's Fast Relief 500 lead was stolen on the start by Richard Childress Racing's Kevin Harvick. Leading the first 21 laps, Harvick's time at the front of the field (ultimately his only moments in the lead of the Goody's Fast Relief 500) would end when the Hendrick Motorsports-owned #24 Chevrolet Impala took the top spot. 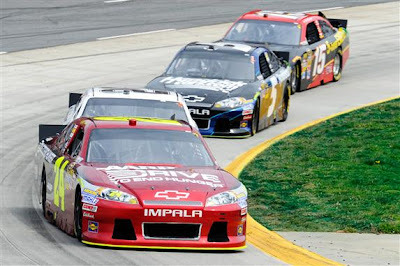 Having won at Martinsville Speedway 7 times in his career, Jeff Gordon demonstrated a feverish pace at the front of the pack in this race. Starting on lap 22, Gordon and the #24 car led often on the Sunday afternoon for what would be 328 laps total. With Jeff Gordon controlling much of the Goody's Fast Relief 500 race at Martinsville, 3 of the 4 Hendrick Motorsports teams were finding their way to fortune on the 0.526-mile oval track. Still searching for his first victory since the 2008 spring event at Michigan International Speedway, Dale Earnhardt Jr continued what has been a very strong start to the 2012 NASCAR Sprint Cup with the #88 Chevrolet. Throughout the event, Earnhardt Jr was able to hang within mid-pack of the top-10 cars. In fact, much of the race was spent with the #88 Hendrick Motorsports car in the top-5. Dealt a speeding pit road penalty early in the Goody's Fast Relief 500, 5-time NASCAR Sprint Cup champion Jimmie Johnson had to overcome a large, compact field of vehicles through the early half of the Martinsville Speedway event. With 6 wins to his credit on the Martinsville track, it seemingly took little effort for Johnson to find his way into the top-5. By lap 356, the #48 Chevrolet piloted by Johnson was leading the race. Through the early course of the 500-lap event, there was only a single caution recorded for the Joe Gibbs Racing #18 Toyota of Kyle Busch. On lap 99, the M&Ms sponsored vehicle sailed into the Martinsville Speedway turn 3 wall after the rear end axle locked up on the Toyota stock car. Requiring an extended stay behind pit wall so the crew could repair the considerable rear end damage, Kyle Busch was recorded 80 laps down to the leader in 36th place. Older brother Kurt Busch in the #51 Chevrolet also had a bad day at Martinsville finishing 33rd following two right-front tires blowing on the racetrack requiring him to pit under green on both occasions. While three of the Hendrick Motorsports were enjoying front-running status in the Goody's Fast Relief 500 race, the pole-sitting car of Kasey Kahne followed its regular path of frustrating results in the 2012 season. 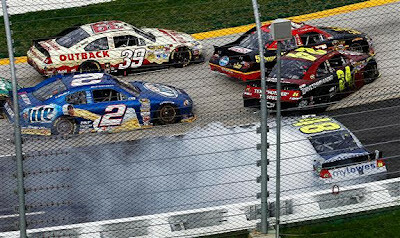 An engine problem in the #5 car was clearly evident during the one-half of the Martinsville event. By lap 316, the engine of Kasey Kahne's Chevrolet expired ending the day for the #5 car. The DNF for Kahne marked the second time the #5 car did not finish a race in the 6 races starting the 2012 campaign. Through the final 100 laps of the scheduled 500-lap event, the Hendrick Motorsports cars of Jeff Gordon and Jimmie Johnson battled for what would be Hendrick Motorsports' 200th race victory. After Johnson led 104 laps in succession, Gordon perfectly planned a move on his teammate with three laps to go. While the execution of the pass was well laid out, Jeff Gordon and the rest of the NASCAR Sprint Cup Series field did not foresee the yellow flag for the #10 car of David Reutimann who stopped on the frontstretch. The pairing of Jeff Gordon and Jimmie Johnson saw their more than 7 seconds ahead of third place Dale Earnhardt Jr evaporate as the caution bunched the entire field for a green-white-checkered finish. With many cars tight on fuel, all lead lap vehicles other than Johnson's #48 Chevrolet and Gordon's #24 Chevrolet pitted. As the green-white-checkered restart commenced, the two leading Hendrick Motorsports cars were immediately under attack from outside contenders. Clint Bowyer in the #15 Toyota for Michael Waltrip Racing saw an opportunity for the race win by taking his car to the inside of both Hendrick Motorsports Chevrolets into turn one. This brave move for Bowyer (who was himself challenged by Ryan Newman on the restart) led to contact between himself and the top Hendrick cars of Jeff Gordon and Jimmie Johnson. All three potential winners was swept up in a coming-together costing the Hendrick cars of a top-10 finish after almost winning the Goody's Fast Relief 500. Skating by the top-3 cars in the lap 505 collision, the #39 Chevrolet of Ryan Newman inherited the race lead with AJ Allmendinger taking second place. Restarting on lap 513, Newman fought a determined #22 Dodge piloted by Allmendinger to go on to race victory. 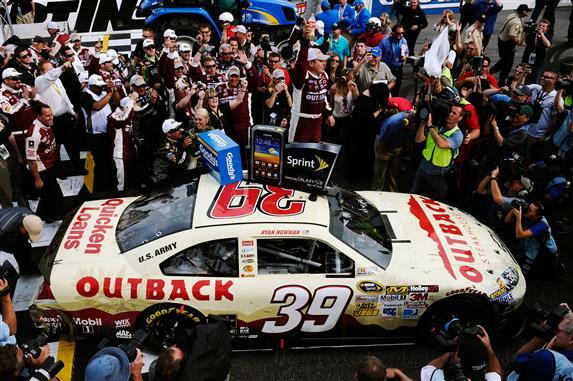 The first win by Ryan Newman and his #39 Stewart/Haas Racing team since New Hampshire, the victory is the Indiana driver's 16th in the NASCAR Sprint Cup Series. AJ Allmendinger came across the line in a tight second, 0.342 seconds behind Newman. While Hendrick Motorsports' chance at a 200th win in the Goody's Fast Relief 500 was foiled, Dale Earnhardt Jr held onto 3rd place in the #88 machine. Matt Kenseth and Martin Truex Jr rounded out the top-5 at Martinsville Speedway.